Oracle WebCenter Portal Cloud launch. – WebCenter Portal Cloud enables automated product deployment and configuration. – A client can focus on building innovative, integrated, and secure business mashups on the cloud. – Scale out your deployment at will when you anticipate demand. Scale in when the demands are high. – Easily monitor your deployments, automate database and application backup, restore from any point in time. – Migrate your on-premises Oracle WebCenter Portal deployment to WebCenter Portal Cloud. – Easy maintenance because Oracle Manages Infrastructure. – Easy to integrate with oracle identity service and SSO. Oracle WebCenter Portal Cloud (WCPC) -Oracle WebCenter Portal Cloud (a customer managed service) provides an enterprise grade portal platform as a subscription service on top of Java Cloud Service so that you can quickly provision your new platform, and start developing and deploying secure portals for intranets, extranets, and self-services. 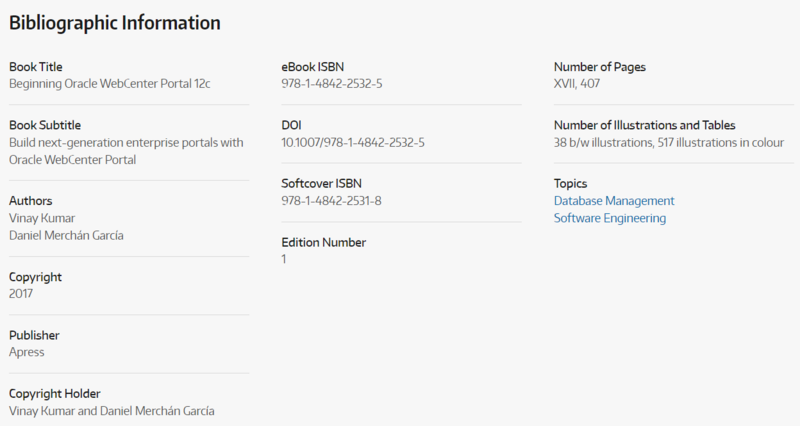 Beginning Oracle WebCenter Portal 12c book– Published!! This book is intended for beginners,expert and software architects, project manager , who are working with WebCenter Portal implementation.Somebody wants to developer rich enterprise portal with WebCenter Portal with WebCenter content and other technologies. Little bit ADF knowledge required. Chapter 1 : Introduction to Enterprise Portals – Introduction of Enterprise portal. Portal vs website and introduction of Oracle FMW. 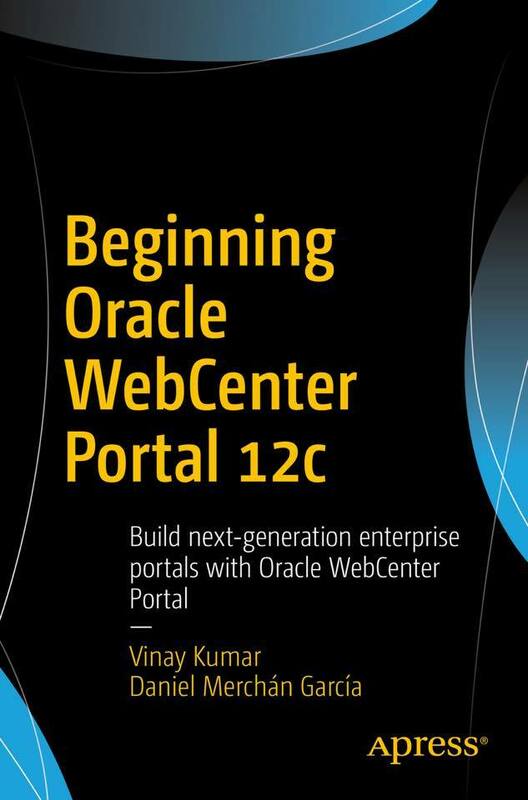 Chapter 2 : Introduction to Oracle WebCenter Portal 12c – First chapter to talk about WebCenter portal. Architecture of portal, Main components of WebCenter Portal.New Features and deprecated features of WebCenter portal 12c. Chapter 3 : Oracle WebCenter Portal12c Administration – How to do administration of WebCenter Portal. Normal task for WebCenter Portal administrator. etc. Chapter 4 : Portal Asset Development – How to set developer environment for Portal Asset development.How to portal asset publishing.How to develop portal asset runtime. Chapter 5 : Working with Pages and Navigation – What Is a Page? Working with System and business Pages. how to Working with Personal and portal Pages,Rendering a Portal Navigation. Chapter 6 : Extend Portal with Shared Libraries– What Are Shared Libraries? You will learn how to deploy nd develop WebCenter Portal Shared Library.explains Development Life Cycle with example. Chapter 7 : WebCenter Portal Task Flow Customization– Overview of customization, How to do taskflow customization on design and run time.Setting Up a Customizable WebCenter Portal Application. Customizing WebCenter Portal Task Flows of Design Time Customization,Deployment of Customized WebCenter Portal Task Flow. Chapter 8 : Portlets Integration Using JSR 286 – What is portlet, What is use of it. Learn when to use portlet and taskflow. Learn to create Portlet. How to convert adf taskflow into portlet.Build JSR 286 portlet and deploy in WCP. Chapter 10 : Portal Security Administration – Learn Security Architecture.Understanding WebCenter Portal Security.Using Enterprise Manager for Security Administration UI,learn Using of WebCenter Portal Security Administration UI.Securing Page Components. Chapter 11 : Content Integration – Learn to integrate WebCenter Content,Publishing Content via WebCenter Content Integration,Learn Integration with Oracle Document Cloud. Publishing Content Using Pages,Publishing Content Using Data Presenter,Publishing Content: Blogs nd wikis. 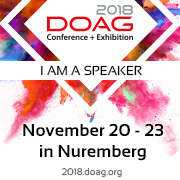 Chapter 12 : Portal Tools and Services – Learn Webcenter portal Analytics,Announcements and Discussions,External Applications. Learn on how to work on Events, Instant Messaging and Presence, links, list, mail,People connections, Notes, Notification, RSS, search and tags. Chapter 13 : Extending WebCenter Portal – Learn how to integrate WebCenter Portal with all third party application for example, EBS, OBIEE etc. Learn how to use portal REST API and WebCenter Portal Java API. So now horn up your ADF skills to learn WebCenter Portal.